Malignancies of the head and neck can result in devastating functional and cosmetic deficits that have a significant psychosocial impact on affected patients. In most cases, the ramifications of undergoing treatment for head and neck cancers extend far beyond the psychological and social aspects. Aside from cosmetic deformities of the head and neck, these patients may also develop deficits in their abilities to speak, eat, swallow, and even breathe. The incidence of head and neck cancers, and thus the need for treatment, has slowly increased,  as has the burden of posttreatment management. The morbidity associated with head and neck malignancies has necessitated the evolution of operative techniques and ushered in an era of innovative conservation surgeries and reconstructive procedures in the field of plastic surgery. These historical landmarks have paved the way for current techniques in epiglottis reconstruction. The review of these techniques first begins with a discussion of the function of the epiglottis. The epiglottis is an elastic leaf-shaped cartilage that covers the entrance to the larynx. It is important in preventing aspiration of solids and liquids. A competent and functional epiglottis is essential for normal eating and swallowing. [9, 10] Dysfunction of the epiglottis can lead to complications such as chronic aspiration, which, in turn, can cause significant pulmonary damage. [11, 12] Epiglottis dysfunction has multiple etiologies, but, in the field of reconstructive surgery, these dysfunctions typically result from anatomic deficits of the epiglottis, such as after supraglottic (horizontal) laryngectomy. During embryologic development, the supraglottic structures (epiglottis, arytenoid cartilages, false vocal folds, ventricle) derive from the buccopharyngeal primordium, which arises from the third and fourth branchial arches. In contrast, the glottis and subglottis are derived from the tracheobronchial primordium of the sixth branchial arch. Because the supraglottis is not embryologically linked to the glottis and subglottis, it derives its blood supply from the superior laryngeal arteries. The lymphatics of the supraglottis travel along the superior laryngeal vessels to the carotid sheath and drain bilaterally into the deep cervical chain nodes in levels II and III of the neck. The epiglottis is considered to be part of the “supraglottis,” which also includes the arytenoid cartilages, false vocal folds, and ventricle. The epiglottis is divided into the suprahyoid epiglottis (lingual and laryngeal surfaces) and the infrahyoid epiglottis. At its most inferior aspect (petiole), the epiglottis is attached to the inner surface of the thyroid cartilage laminae above the anterior commissure and projects posteriorly into the pharynx. Laterally, it is attached to the quadrangular membrane, an accessory elastic structure that provides support to the supraglottic structures. Along with the thyroepiglottic ligament, the anterior surface of the epiglottic cartilage forms the posterior boundary of the pre-epiglottic space (see images below). Laryngoscopic view of the larynx. Note the following supraglottic structures: epiglottis, aryepiglottic folds, arytenoids, and false folds. 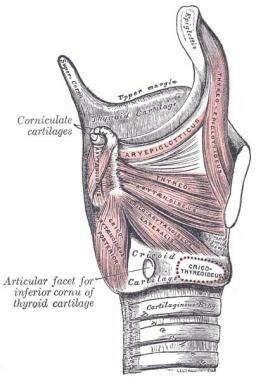 Ligaments of the larynx, posterior view. 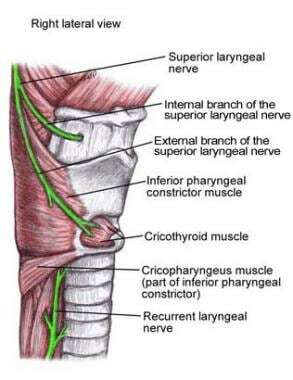 Sensory information is provided to the epiglottis by the internal branch of the superior laryngeal nerve, which also gives off sensory fibers to the base of tongue, the valleculae, pyriform sinus, the aryepiglottic folds, and the vestibule of the larynx down to the level of the glottis. 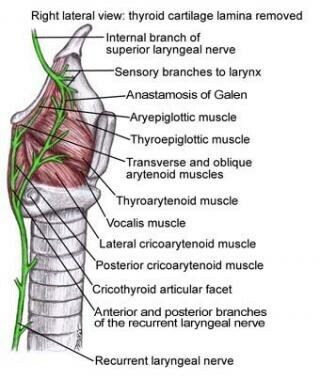 The recurrent laryngeal nerve provides motor innervation to all the intrinsic muscles of the larynx (except the cricothyroid muscle) and sensory innervation to the glottis, subglottis, and trachea (see images below). No standardized method has been established for reconstruction of the epiglottis; thus, this article is an overview of the various techniques that have been described in the literature. In the case of malignancy, the decision to reconstruct the epiglottis is based on tumor staging and spread and may be influenced by postsurgical treatments such as chemotherapy and radiation therapy. The main contraindication to epiglottis reconstruction is extensive tumor invasion. In patients who are undergoing total laryngectomy or who require significant tumor resection, epiglottis reconstruction is not performed. Peripheral vascular disease may also pose a difficulty in the patient undergoing a free flap repair, as this places the flap at risk for necrosis secondary to poor circulation. Tissue fibrosis in a patient with a history of radiation is another limiting factor in selecting flap donor sites, as is scarring from previous surgical procedures. If the tumor extends to the infrahyoid portion of the epiglottis, the method of reconstruction is fairly limited and may be accomplished using the hyoid bone as an osteomuscular flap. In all of the techniques listed above, a remnant stump of the epiglottis (at the petiole) is used for reconstruction. Alternatively, no reconstructive technique may be undertaken, and the laryngeal defect can be closed primarily (closed with suture) or secondarily (allowed to fill in with granulation tissue) or with a local rotational flap. Calcaterra TC. Epiglottic reconstruction after supraglottic laryngectomy. The Laryngoscope. 1985. 95:786-789. Liepzig B, Zellmer JE, Klug D; and the Panendoscopy Group. The Role of Endoscopy in Evaluating Patients with Head and Neck Cancer. Archives of Otolaryngology. 1985. 111:589-594. Schbchter GL. Epiglottic reconstruction and subtotal laryngectomy. The Laryngoscope. 1983. 93:729–734. Curado MP, Hashibe M. Recent changes in the epidemiology of head and neck cancer. Current Opinion in Oncology. 2009. 21:[Full Text]. Stiefel M, Shaner A, Schaefer SD. The Edwin Smith Papyrus: the birth of analytical thinking in medicine and otolaryngology. Laryngoscope. 2006. 116:182-188. Garon BR, Huang Z, Hommeyer S, Eckman D, Stern GA, Ormiston C. Epiglottic dysfunction: abnormal epiglottic movement patterns. Dysphagia. 2002. 17:57-68. Negus VE. The function of the epiglottis. J Anat. 1927. 62:1-8. Barclay AE. The normal mechanism of swallowing. Mayo Clin Proc. 1930. 5:251-257. Murray GM. Pulmonary complications following supraglottic laryngectomy. Clin Otolaryngol. 1976. 1:241-247. Rademaker AW, Logemann JA, Pauloski BR, Bowman JB, Lazarus CL, Sisson GA. Recovery of postoperative swallowing in patients undergoing partial laryngectomy. Head Neck. 1993. 15:325-334. Armstrong WB, Vokes DE, Maisel RH. Malignant tumors of the larynx. Flint PW, Haughey BH, Lund, VJ. Cummings Otolaryngology: Head & Neck Surgery. 5. Philadelphia, PA: MOSBY ELSEVIER; 2010. 1482-1511/107. [Full Text]. Guardiola E, Pivot X, Dassonville O. Is routine triple endoscopy for head and neck carcinoma patients necessary in light of a negative chest computed tomography scan?. Cancer. 2004. 101:2028-2033. Dohar JE, Greenberg LL, Galera RI. 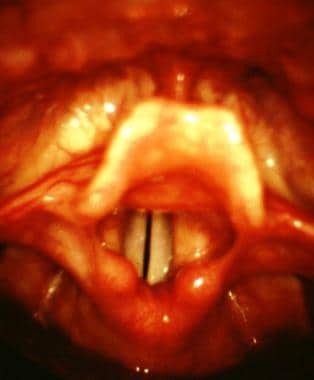 The dysphonic videolaryngoscopy with stroboscopy paradox and challenge of acquired subglottic stenosis after laryngotracheal reconstruction. Int J Pediatr Otorhinolaryngol. 2013 May. 77(5):732-8. [Medline]. Atkins JP, Keane WM, Young KA, Rowe LD. Value of Panendoscopy in Determination of Second Primary Cancer. Archives of Otolaryngology. 1984. 110:533-534. Hoover LA, Calcaterra TC, Walter GA, Larrson SG. Preoperative CT scan evaluation for laryngeal carcinoma: correlation with pathological findings. The Laryngoscope. 1984. 94:310-315. Di Martino E, Nowak B, Hassan HA. Diagnosis and staging of head and neck cancer a comparison of modern imaging modalities (positron emission tomography, computed tomography, color-coded duplex sonography) with panendoscopic and histopathologic findings. Arch Otolaryngol Head Neck Surg. 2000. 126:1457-1461. Schöder H, Yeung HWD, Gonen M, Kraus D, Larson SM. Head and neck cancer: clinical usefulness and accuracy of PET/CT image fusion1. Radiology. 2004. 231:65-72. Gilbert MR, Branstetter BF, Kim S. Utility of positron-emission tomography/computed tomography imaging in the management of the neck in recurrent laryngeal cancer. The Laryngoscope. 2012. 122:821-825. Bloching M, Berghaus A. Rehabilitation des Schluckvermögens nach Tumorresektion — Funktionelle Rekonstruktion der Supraglottisregion mit einem fasziokutanen Unterarmlappen und Septumknorpel. HNO. 2004. 52:693-698. Akyildiz S, Ozturk K, Turhal G, Gode S, Kirazli T, Uluoz U. Post-surgical and oncologic outcomes of frontal anterior laryngectomy with epiglottic reconstruction: a review of 68 cases. Am J Otolaryngol. 2015 May-Jun. 36 (3):371-6. [Medline]. Calcaterra TC. Epiglottic reconstruction after supraglottic laryngectomy. Laryngoscope. 1985 Jul. 95(7 Pt 1):786-9. [Medline]. Hsiao HT, Leu YS, Tung KY. Epiglottis reconstruction with free radial forearm flap after supraglottic laryngectomy. Am J Otolaryngol. 2010 Mar-Apr. 31(2):132-5. [Medline]. OGURA JH. Supraglottic subtotal laryngectomy and radical neck dissection for carcinoma of the epiglottis. Laryngoscope. 1958 Jun. 68(6):983-1003. [Medline]. Fukui MB, Blodgett TM, Snyderman CH. Combined PET-CT in the head and neck. Radiographics. 2005. 25:913 –930. Guardiola E, Chaigneau L, Villanueva C, Pivot X. Is there still a role for triple endoscopy as part of staging for head and neck cancer?. ? Current Opinion in Otolaryngology & Head and Neck Surgery. 2006. 14:85-88. Sevilla MA, Rodrigo JP, Llorente JL, Cabanillas R, López F, Suárez C. Supraglottic laryngectomy: analysis of 267 cases. Eur Arch Otorhinolaryngol. 2008 Jan. 265(1):11-6. [Medline]. Whitaker IS, Karoo RO, Spyrou G, Fenton OM. The birth of plastic surgery: the story of nasal reconstruction from the Edwin Smith Papyrus to the twenty-first century. Plast Reconstr Surg. 2007 Jul. 120(1):327-36. [Medline]. Rasheed T, Lewis HG, Gordon DJ. A review of 100 consecutive free tissue transfers. Ulster Med J. 2000 May. 69(1):14-8. [Medline]. [Full Text]. Stevens MH, Harnsberger HR, Mancuso AA, Davis RK, Johnson LP, Parkin JL. Computed tomography of cervical lymph nodes. Staging and management of head and neck cancer. Arch Otolaryngol. 1985 Nov. 111(11):735-9. [Medline]. Sham ME, Nishat S. Imaging modalities in head and neck cancer patients- overview. Journal of Cancer Research and Experimental Oncology. 2011. 3:22-25. Zinreich SJ. Imaging in laryngeal cancer: computed tomography, magnetic resonance imaging, positron emission tomography. Otolaryngol Clin North Am. 2002 Oct. 35(5):971-91, v. [Medline]. Becker M, Burkhardt K, Dulguerov P, Allal A. Imaging of the larynx and hypopharynx. Eur J Radiol. 2008 Jun. 66(3):460-79. [Medline]. Fakhry N, Michel J, Giorgi R, Robert D, Lagier A, Santini L, et al. Analysis of swallowing after partial frontolateral laryngectomy with epiglottic reconstruction for glottic cancer. Eur Arch Otorhinolaryngol. 2014 Jul. 271(7):2013-20. [Medline]. Ariyan S. The pectoralis major myocutaneous flap. A versatile flap for reconstruction in the head and neck. Plast Reconstr Surg. 1979 Jan. 63(1):73-81. [Medline]. Ashjian P, Chen CM, Pusic A, Disa JJ, Cordeiro PG, Mehrara BJ. The effect of postoperative anticoagulation on microvascular thrombosis. Ann Plast Surg. 2007 Jul. 59(1):36-9; discussion 39-40. [Medline]. BAKAMJIAN VY. A TWO-STAGE METHOD FOR PHARYNGOESOPHAGEAL RECONSTRUCTION WITH A PRIMARY PECTORAL SKIN FLAP. Plast Reconstr Surg. 1965 Aug. 36:173-84. [Medline]. Chantrain G, Deraemaecker R. Glottic reconstruction after cricohyoidoepiglottopexy with a radial forearm free flap that includes the tendon of the palmaris longus: preliminary results and perspectives. Laryngoscope. 1994 Aug. 104(8 Pt 1):1035-40. [Medline]. Chien W, Varvares MA, Hadlock T, Cheney M, Deschler DG. Effects of aspirin and low-dose heparin in head and neck reconstruction using microvascular free flaps. Laryngoscope. 2005 Jun. 115(6):973-6. [Medline]. Daniel RK, Taylor GI. Distant transfer of an island flap by microvascular anastomoses. A clinical technique. Plast Reconstr Surg. 1973 Aug. 52(2):111-7. [Medline]. Hagen R. Laryngoplasty with a radialis pedicle flap from the forearm: a surgical procedure for voice rehabilitation after total laryngectomy. Am J Otolaryngol. 1990 Mar-Apr. 11(2):85-9. [Medline]. McConnel FM, Pauloski BR, Logemann JA, Rademaker AW, Colangelo L, Shedd D. Functional results of primary closure vs flaps in oropharyngeal reconstruction: a prospective study of speech and swallowing. Arch Otolaryngol Head Neck Surg. 1998 Jun. 124(6):625-30. [Medline]. Oe A, Kawabe J, Torii K, Kawamura E, Kotani J, Hayashi T, et al. Detection of local residual tumor after laryngeal cancer treatment using FDG-PET. Ann Nucl Med. 2007 Jan. 21(1):9-13. [Medline]. Schwager K, Hoppe F, Hagen R, Brunner FX. Free-flap reconstruction for laryngeal preservation after partial laryngectomy in patients with extended tumors of the oropharynx and hypopharynx. Eur Arch Otorhinolaryngol. 1999. 256(6):280-2. [Medline]. SEIDENBERG B, ROSENAK SS, HURWITT ES, SOM ML. Immediate reconstruction of the cervical esophagus by a revascularized isolated jejunal segment. Ann Surg. 1959 Feb. 149(2):162-71. [Medline]. [Full Text]. Suh JD, Sercarz JA, Abemayor E, Calcaterra TC, Rawnsley JD, Alam D. Analysis of outcome and complications in 400 cases of microvascular head and neck reconstruction. Arch Otolaryngol Head Neck Surg. 2004 Aug. 130(8):962-6. [Medline]. Vos JD, Burkey BB. Functional outcomes after free flap reconstruction of the upper aerodigestive tract. Curr Opin Otolaryngol Head Neck Surg. 2004 Aug. 12(4):305-10. [Medline]. Yamawaki S, Sawabe K, Kataoka K, Tanaka S, Suzuki S. The combined use of hyoid bone flap and radial forearm free flap for reconstruction following partial laryngopharyngectomy. Ann Plast Surg. 2011 Mar. 66(3):257-60. [Medline]. Example of a bilobed radial forearm free flap. The proximal stump "B" will be used to re-create the epiglottis, while the distal stump "A" will be used to reconstruct the base of tongue and other structures of the supraglottis. The flap is sutured into the shape of a normal epiglottis to cover the tracheal inlet. Tumor involvement of the epiglottis and the proposed margins for resection. The neo-epiglottis (reconstructued from the epiglottis remnant) covers the airway. Reconstruction of the epiglottis using a hyoid bone osteomuscular flap. The blue arrow shows the attachment of the hyoid bone to the remaining stump of the epiglottis, while the black arrow indicates the muscular portion of the flap (sternohyoid muscle).